I've been thinking a bit about Google Buzz since a few days before it was announced, and I really think it has the potential to be huge. Especially when one takes into account all the stuff the API already does, and all the things it promises to be able to do in the near future. Having one open spot to have masses and masses of interesting content aggregated to you from your Twitter, Facebook, Delicious, Livejournal, Blogger and Wordpress contacts is pretty cool, but when they're able to pull in all comments via Salmon, pretty much anything anyone ever directs towards you on the Internet will be accessible there as well. Post a comment on some random stranger's blog? If it gets a reply, it'll (one day) show up in your Google Buzz. That's pretty darn cool. Magical utopian fantasyland aside, the current implementation of Buzz leaves much to be desired. GMail clutter. I haven't yet figured out the magics that determine when something shows up in your GMail inbox as well as in Buzz, but some things do. Other things don't, however, which makes it far more annoying. Sure, you can set up a filter easily enough to hide those from your inbox, but I'd really like to know how it determines what should go in your inbox in the first place. Is it just replies to Buzz posts older than a certain age? Who knows. In any case, I'm sick of getting email notifications of things I've already read in Buzz. I frequently share interesting things I see from my Google Reader account. Over the years I've amassed quite a few cool people that also share cool things, and often encounter really cool stuff I wouldn't have otherwise. I've always been bummed that most of the stuff I share is pretty much unfindable by those who don't use Google Reader -- and there are more that don't than there are that do -- which seems to have been solved by the incorporation with Buzz. However, my Google Reader contacts are now full of people I've added on Buzz, often who share things in which I have no interest. Even the things that I do have interest in are frequently seen in my Buzz stream before I find them again in my Google Reader. There needs to be some better communication between the two so that I don't always end up seeing everything everyone shares in two different places. Add GMail clutter to the mix, and I often see the same content in three different places. I have great hope that Buzz is going to make many, many irritating things a much nicer experience than the Twitters and Friendfeeds and Faceooks currently offer (primarily because it promises to be able to put all that content in one nice place to which I can interface in unlimited ways ) but I worry that people are going to be annoyed to death before it gets to that point. Even with these annoyances, however, Buzz is still infinitely more usable and less annoying that Google Wave, though. I can actually see myself using Buzz. If you're not already following me on Buzz, you can do so by adding jer@nyquil.org, and jerwarren@gmail.com. (Due to the aforementioned schism between Apps for Domains Google Accounts and GMail accounts. 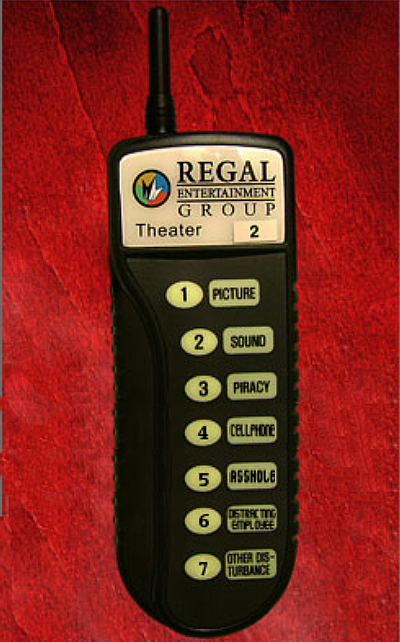 Regal Theaters is about to test out an interesting methodology to combat some common irritations people associate with going to the movies. The device [pictured below] will be available to select patrons, having buttons to easily alert management to several problems.